Are We Headed for Another Bursting Housing Bubble in 2017? Housing prices may be appreciating at a seemingly unsustainable rate once again in some markets around the country, but Christopher Thornberg believes the nation’s economic fundamentals will continue to be much more sound in 2017 than when the market began to implode back in 2005. The state of the nation’s economy and the economic variables that eventually led the country into the Great Recession were vastly different back then compared to the more stable trends that currently exist. While overheated home prices may have been a contributing factor to the housing bubble, they alone were not the needle that finally burst the overinflated bubble after prices peaked in 2006. Prices are an important contributing factor, but Thornberg cites three more crucial economic factors he believes led to the market’s final undoing and the loss of so much equity so quickly. Those three factors were: declining affordability, the overbuilding of housing supply, and the abuse of leveraged debt. Back in 2005 while affordability was falling, Thornberg explained, home price increases were being driven by markets on the periphery instead of the nation’s big markets which remained relatively cool. At the same time, the pace of home construction was out of control, with builders adding roughly 2 million housing units instead of the 1 million he estimates the market actually needed at the time. Plus the number of outstanding home mortgages were growing exponentially thanks to some creative financing vehicles such as so-called “no doc” loans and sub-prime financing. By contrast, Thornberg maintains that current indicators suggest that the U.S. housing market is still in the process of recovering. Attom Data Solutions in Irvine, Calif., reported in December that the nation’s affordability index hit 103 during the fourth quarter of 2016, its lowest level since the 102 reported for the same quarter of 2008. As Daren Blomquist, senior vice president of Attom Data Solutions (parent company of RealtyTrac) explains it, when the housing affordability index for any market hits below 100, that means the market is in some sort of bubble, but not necessarily a bubble that is ready to burst. “It just means that a lot of local buyers are locked out of the housing market. We need local buyers to be able to afford to purchase homes in order to ensure sustainable growth in that market for the long term,” Blomquist says. Of the 447 counties studied, the firm’s Q4 2016 Home Affordability Index reported that 29 percent of local markets were less affordable than their historic averages, the highest share since the third quarter of 2009. For purposes of its report, Attom took publicly recorded sales deed data it collected and average wage data from the U.S. Bureau of Labor Statistics in all those counties with a combined population of more than 184 million people. The firm’s affordability index is a measurement based on the percentage of average wages needed to make monthly house payments, including property taxes and insurance, on a median-priced home with a 30-year fixed-rate mortgage and a 3 percent down payment-. “Rapid home price appreciation and tepid wage growth have combined to erode home affordability during this housing recovery, and the recent uptick in mortgage rates only accelerated that trend in the fourth quarter,” Blomquist says. Blomquist is quick to point out, however, that Attom’s affordability data is not comparing markets to each other, but instead comparing a market to itself, historically speaking. “We thought it was more fair to compare a market to itself because in some places people have always been willing to spend more of their income on housing because of the location,” he notes. Still, a scarcity of housing supply around the country has led to very strong home price growth compared to lackluster wage growth in many markets, and that is causing the current decline in affordability. In all, Attom reported that annual home price growth outpaced annual wage growth in 363 out of the 447 counties (81 percent) surveyed. Additionally, Blomquist explains that the demand for housing is another contributing factor to the affordability issue. Potential first-time homebuyers are facing increased competition not only from other owner-occupant homebuyers, but also from institutional buyers from Wall Street – as well as hedge funds – and from foreign buyers. Those institutional and foreign buyers are willing to pay more for whatever homes are available than the first-timers. When it comes to new home construction, the National Association of Home Builders is projecting 873,000 single family starts this year, a 13 percent increase compared to 2016. “There doesn’t appear to be any real evidence of a housing bubble looming on the horizon,” says Rick Sharga, executive vice president at Ten-X, an online real estate marketplace based in Irvine, CA. 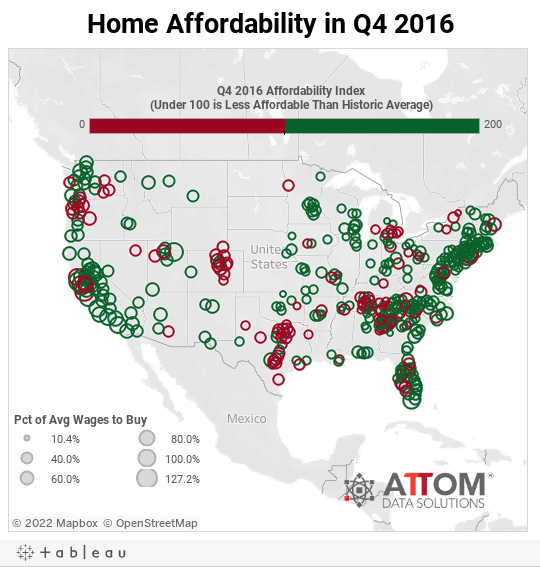 Compared to a year ago, housing affordability improved in 18 percent of the markets analyzed for Q4 2016, Attom reports. The most populated counties with the most improvement in affordability for the quarter were Suffolk County, NY; Bronx County, NY; Fairfax County, VA; the Washington, D.C. metro area; Fulton County, GA; and Fairfield County, CT. The most populated counties with worsening affordability for the quarter on a year-over-year basis were Los Angeles County, CA. ; Harris County, TX; Maricopa County, AZ. ; San Diego County, CA. ; and Orange County, CA. Based on Attom’s analysis, average wage earners had to spend 36.9 percent of their income to buy a median-priced home, below the historic average of 39.1 percent, but an increase from the 35.2 percent measured a year ago. Taking that as an absolute standard for wage earners seeking to buy the median-priced home, the counties that were least affordable during the quarter were Kings County, NY; Santa Cruz County, CA. ; Marin County, CA. ; Summit County, UT; New York County, NY; San Francisco County, CA. ; Kauai County, HI; San Luis Obispo County, CA. ; Maui County, HI; and Monroe County, FL. The most affordable counties considering the same wage standard for the quarter were Clayton County, GA; Roane County, TN. ; Bay County, MI; Bibb County, GA; and Richmond County, GA. In his annual forecast for 2017, Lawrence Yun, chief economist for the National Association of Realtors, says he thinks the tight inventory on the supply side, and the affordability issue on the demand side of the equation will both slowly abate in many markets. Yun also anticipates that total housing starts will rise 5.3 percent for the year to 1.22 million. Of those, his forecast calls for an 8.3 percent growth in single family starts for the year. Given the projections of both Yun and Thornberg, it appears that neither of them is expecting to see another national housing bubble burst in 2017.